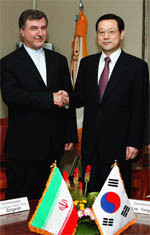 Nation's highest tax official, Commissioner Yong-Sup Lee (right) of National Tax Service (NTS), shakes hands with Iranian chief of tax administration, Zanganeh at Mr. Lee's office on Aug. 24, 2004. Mr. Zanganeh and his entourage visited Commissioner Lee's National Tax Service building in Chongjin-dong, Jongno-Gu, on the day. They exchanged ideas on NTS information system.